We have seen such interesting desktop modification concepts like right click menu alternative mockup, creative button concepts by IZO design etc. Warning themes concept is another interesting idea worth a look. The rationale behind the concept to make it clear to the user that, opening something like a filebrowser as root is not the 'normal' way to do things and such actions could damage their system. The original idea can be found at Ubuntu Artwork Concepts page. And its like an year old, the last edit to this wiki page was done in early 2009. But I think, it's still an interesting idea especially if you haven't heard about it before. Opening applications with sudo is becoming more common and many quite inexperienced users are finding instructions to do so on forums, blogs etc. It should be clear to a user when opening something like a filebrowser as root that they are able to do damage to their system and that it is not the 'normal' way to do things. In XFCE, Thunar and Mousepad do a nice trick of having a red box when you're running the app as superuser to warn you that bad things could happen. It would be ideal if there was a way to implement this in a non-application-specific way. 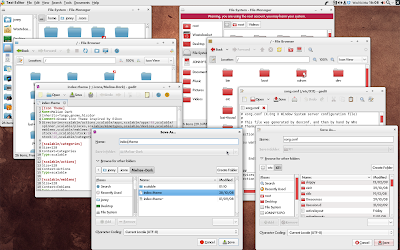 A possible solution according to the author is to create or choose a red icon and gtk theme, place those in the .icons and .themes directory in /root, and then make that theme have the same name as the icon and gtk themes being used by the user. Obviously, when a user change themes, it will be lost. But many newbie users may never change their themes. Same can be said about server environments, where admins normally won't play much with the looks of their desktop. An obvious problem as the author himself points out is that, /root like user home directories, is not a valid install directory. Screenshot above demonstrates the idea. Here is a closer look. The message at the top says, "Warning, you are using your root account, you may harm your system". Quite an interesting idea, isn't it, Whats do you guys think?